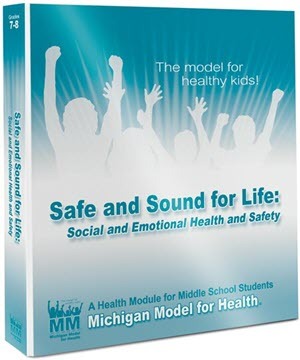 Safe and Sound for Life: Social and Emotional Health and Safety - Michigan Model for Health. This module, intended for use in grades 7-8, includes 15 lessons that assist the student in developing six of the seven health skills required by the National Health Education Standards and addesses all of the skill categories required by the Michigan Health Education Standards.Teacher Resource flash drive is included. Support materials purchased separately.